In the 1800s many patent medicines used by New Zealanders included opium and cannabis in their ingredients, both of which were made illegal in the 20th century. Because of strict border controls many hard drugs are rare in New Zealand in the 2000s. However, the country has one of the highest levels of cannabis use in the world. Drugs are substances that affect the mind or body. Most drugs used by New Zealanders are medicines to treat illnesses, but some people use drugs for pleasure. In the 1800s there was widespread use of drugs as medicines in the United Kingdom, and British settlers brought this practice to New Zealand. Both opium and cannabis (marijuana) were used to treat illnesses, and both were included in widely available patent medicines. While some people became addicted to opium, drugs did not seem to generally be used recreationally in 19th-century New Zealand. One exception is the smoking of opium by Chinese miners. There was little recreational use of cannabis until the mid-1960s, when ‘hippie’ culture reached New Zealand. Police responded by setting up vice squads to combat the problem. In the 2000s about half of those aged 15–45 had tried cannabis, though only 15% were current users. 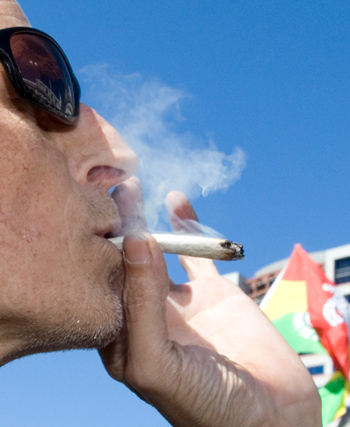 New Zealand has one of the highest rates of cannabis use in the world. New Zealand has strict border controls, which make it difficult for hard drugs to enter the country from overseas. Drugs that are produced within New Zealand, such as ‘homebake’ (an opiate) and amphetamines are more common. Drugs made from opium are not widely used in the 2000s, and cocaine is even rarer. The most common amphetamine (a stimulant) used in New Zealand is methamphetamine, commonly called ‘P’. It is very addictive and can make users paranoid and violent. Other drugs sometimes used in New Zealand include LSD, ecstasy, magic mushrooms, BZP and fantasy (GHB). Drug users tend to be aged in their 20s or early 30s, and more men use drugs than women. In the late 1800s New Zealand passed laws to regulate the sale of opium. The Chinese community also campaigned against opium use. The Opium Prohibition Act 1901 made it illegal to smoke opium. Because of law changes and public opinion, opium was removed from patent medicines. In the 1910s and 1920s, and again in the 1960s, laws about drugs were tightened because of international agreements. Since 1975 illegal drugs have been classified as Class A (a very high risk of harm), Class B (a high risk of harm) or Class C (a moderate risk of harm). Many drugs are kept out of New Zealand through the country’s strict border controls. Police frequently raid cannabis growers and ‘P’ labs. Government agencies and voluntary organisations provide education about the damaging effects of drugs, and assist recovering drug addicts. From the 1990s there were calls for cannabis to be legalised. However, concerns about the health effects of cannabis, particularly on the young, make this unlikely.